Stoke Coal Fire Pizza and Bar recently celebrated its first anniversary on Centre Square. 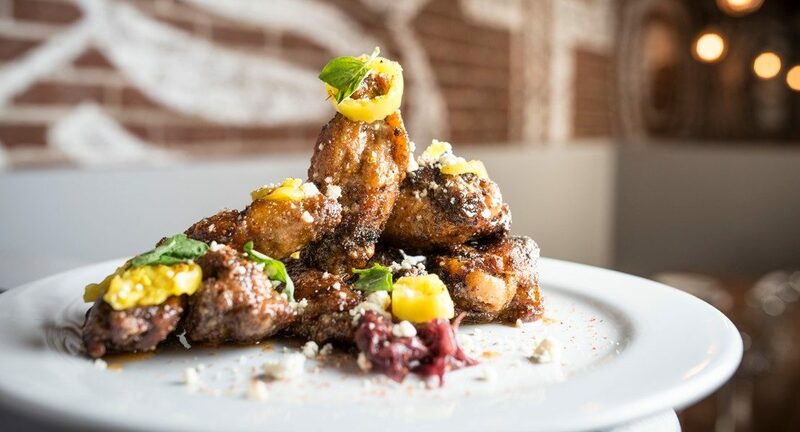 This unique addition to the downtown Easton dining scene has developed a strong following in its short tenure and it’s easy to see why. The chic surroundings and hospitable people make it easy on the eyes, friendly to the senses, and pleasant to the taste buds. The tables were filled with an eclectic mix of patrons the night I celebrated a Girls’ Night Out with two friends. Theresa, Bhamini, and I cozied up to the bar where Maurizio, who has been holding court at the bar since Stoke opened, was serving up half-priced bottles of wine, which is the norm on Tuesday nights. We enjoyed a Madonna Estate 2012 Pinot Noir while checking out the decor. The attractive bar seats around 15 and was relatively full for a Tuesday night; the restaurant itself seats around 90 people at high tops, tables, and booths. Accented by soft earthy colors, the exposed brick walls, unique lighting, wainscot, and sparkling original wooden floors create a warm and welcoming atmosphere. I spotted Executive Chef Abe Lopez (formerly of Valenca) busy at work in the kitchen. Stoke boasts a 5000 pound coal-fired pizza oven that heats to more than 750 degrees, allowing them to cook a pizza in a mere two to three minutes. Owners Rich Rosati and Jack Onorati, of Colonial Pizza and Spaghetti House fame, are no strangers to the pizza world. Colonial Pizza and Spaghetti House on Easton’s Spring Garden Street has been a city staple for over a half-century, but this new location introduces a compelling modern menu. Colleen and Roselle showed us to our table and were our very efficient servers for the evening. We started with two appetizers. First was the Spinach and Gorgonzola Salad with figs soaked in red wine, spiced pecans, and pickled onions topped with sweet onion peppercorn vinaigrette. The salad was outstanding—the mixture of savory and sweet on fresh crisp greens was delicious and perfect for sharing. Our other appetizer choice, Stoke Sticks, was unbelievable. These polenta fries were served with two spicy aiolis—garlic and sun-dried tomato. They arrived piping hot at the table and we devoured them. The Stoke Sticks paired perfectly with the salad, and I would not hesitate to order them again. One warning: Be sure to eat them while they’re hot. The texture and taste of the Sticks changed after they cooled off. Still good, but better hot! In addition to our choice of salad, there is also a House Salad of arugula, shaved Parmesan, Kalamata olives, cherry tomatoes, and shaved fennel with a housemate lemon vinaigrette as well as a Classic Caesar Salad on the menu. Grilled Chicken, Chicken Milanese, or Shrimp may be added to any salad for a small upcharge. For those who opt for soup instead of salad, four choices are available: Manhattan Clam Chowder, Butternut Squash, Curried Cauliflower, and Italian Wedding. Other appetizers include Anna’s Italian Meatballs with Parmigiano-Reggiano, marinara, and herbed ricotta as well as a Fire Roasted Stuffed Pepper with Bolognese and risotto topped with a poached egg and shaved Parmesan. I have already decided to order this on my next visit. Mussels served either Samba or Fra Diavlo; Orange Balsamic Glazed Baby Back Ribs; Homemade Gnocchi with peas, mushrooms, and arugula in a truffle vinaigrette; Risotto Primavera; and a Charcuterie Plate round out Stoke’s appetizer menu that offers something for everyone. There are nine gourmet pizzas on the menu, all of which sound incredible. We decided on three individual pizzas to try. First came the Fig and Pig—balsamic fig spread, prosciutto, garlic and Béchamel sauce topped with arugula. This was amazing and very different from anything we’ve had before. Next came Sausage and Coal-roasted Peppers with marinara, mozzarella and Romano. This was a more traditional pizza than the first, but the sauce and spicy sausage and peppers were great. Last but not least was the Carbonara Pizza with slab bacon, sweet peas, Parmesan, roasted garlic, dippy egg, and Béchamel sauce. This was probably the most unique of the three with a wonderful blend of tastes, and the dippy egg—wow! We enjoyed all three, but here is how we voted: Theresa preferred the Carbonara, Bhamini the Sausage and Peppers, and I chose the Fig. There are still six to try next time including a Fungi Bianco, a Margherita and an all-meat Carnivoro. Flour imported from Italy goes into the crust and is very different, with a slightly sweet and softer quality. Hungry for more? A few entrees that caught my eye include Anna’s Sunday Dinner—meatballs in marinara with rigatoni, roasted garlic and mozzarella; Shrimp and Grits in a white wine-lemon butter sauce, grape tomatoes, and asparagus over polenta; or Braised Beef and Pork Ragu with house-cut pappardelle in a rich tomato sauce. Numerous specialty sandwiches, both hot and cold, are also on the menu including Meatball, Chicken, Eggplant, or Shrimp Parmigiana sandwiches, all of which are perfect for lunch and sound delish. All desserts are made in-house by Olga, Stoke’s pastry chef. We shared the Pumpkin Panna Cotta, which was light and wonderful. Fresh hot coffee finished off the meal. Also available that evening were Pumpkin Cheesecake, Chocolate Cake, and Fresh Cannoli, which had the most scrumptious Cannoli filling that had a touch of orange zest and added a refreshing taste to the creamy filling. 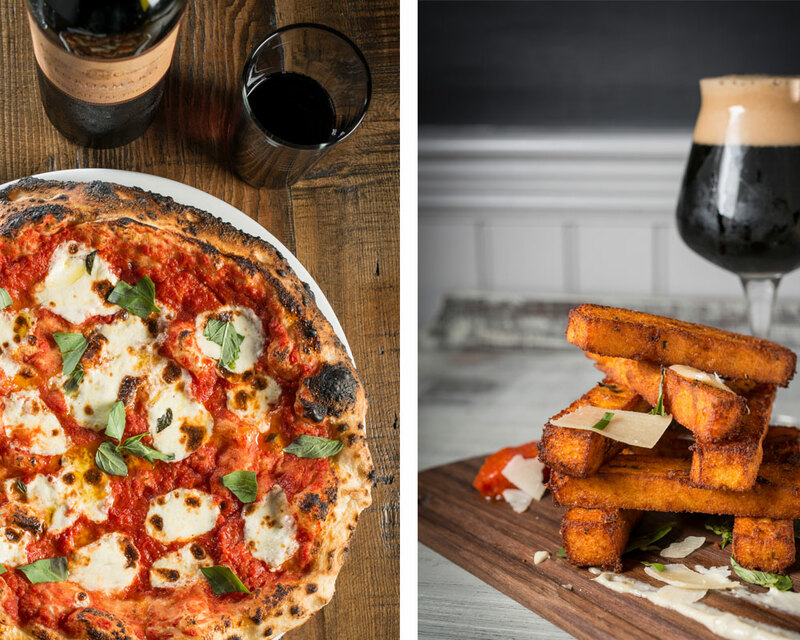 Stoke Coal Fire Pizza and Bar is located at 1 Lehn’s Court on Easton’s Centre Square. Hours of operation are Sunday – Thursday 11:30 a.m. to midnight; Friday 11:30 a.m. to 2 a.m. There is on-street metered parking as well as nearby parking lots. 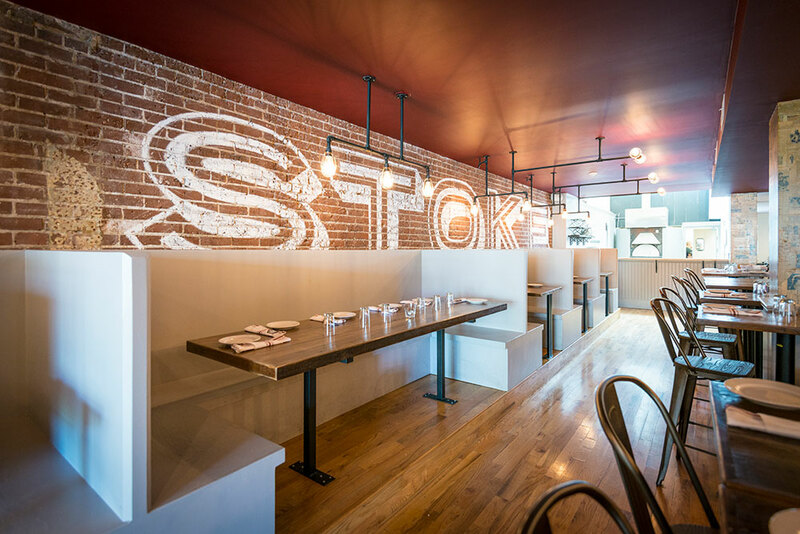 Call 610.829.1400 or visit stokecoalfirepizza.com for additional information.